Is this a vegetable stir-fry or a vegetable braise? 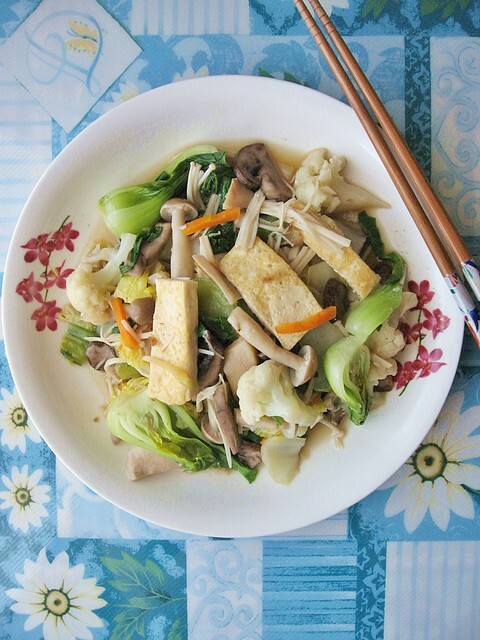 This dish leans towards quick and simple braising (in this context which means frying it quickly then simmering in a covered pot with a small amount of liquid) of Napa cabbage with mushrooms and tofu. 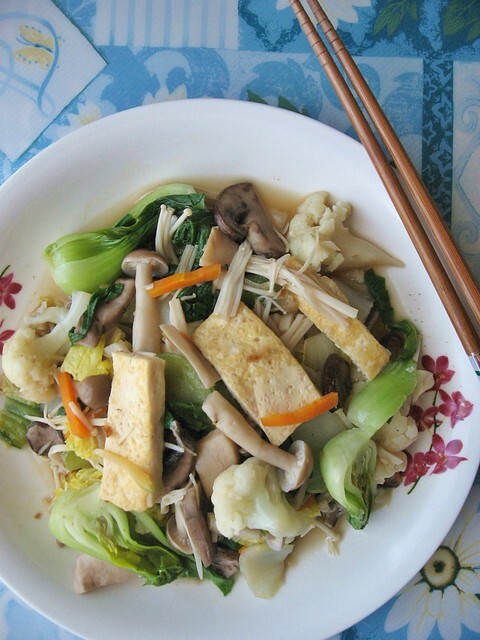 Unlike Napa Cabbage, Mushrooms and Tofu Stew which can afford a little more cooking/simmering time, this vegetable dish should not be overcooked due to the presence of other vegetables particularly leafy greens. If there are leftover vegetables such as Bok Choy, cauliflower in the fridge, they can be added to this dish and it will make quite a substantial dish; a dish that can be good enough to go solo or to pair with rice. 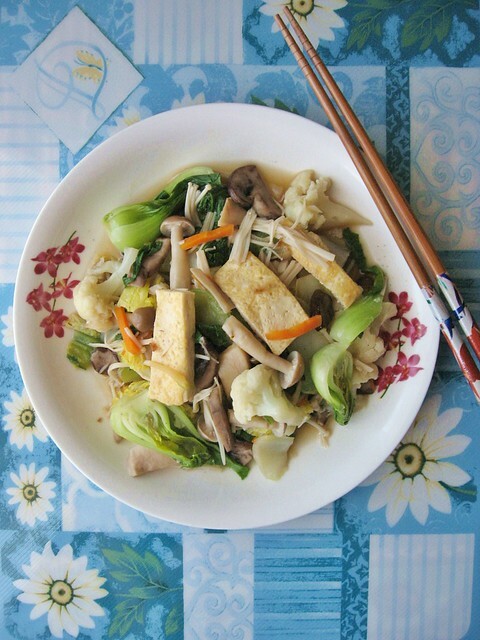 With the addition of four varieties of mushrooms - oyster mushrooms, beech mushrooms, crimini mushrooms and enoki mushrooms, a vegetarian dish can be made very wholesome, nutritious, healthy and delicious. 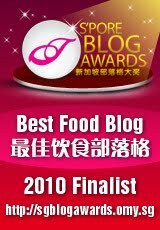 The fancy name, often used in some Chinese restaurants, is Buddha's Delight 罗汉斋; otherwise it is also known as Combination Vegetarian Stir-Fry 什锦炒菜. Directions: Heat some oil in the wok or pan, fry the ginger and garlic till fragrant. Add all the mushrooms (except the enoki; depending on preference, as enoki cooks very fast and if added too early, tends to turn very soft at the end of cooking), add soy sauce and fry for a few minutes. 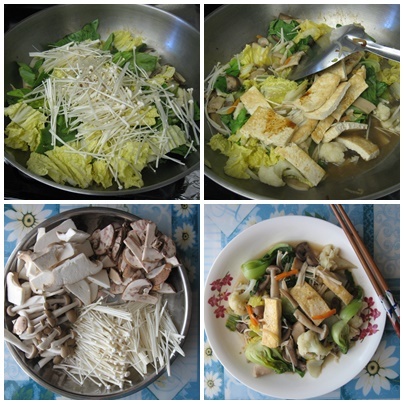 Add in half the stock, let the mushrooms cook and soften a bit, then add all other vegetables and tofu (except Bok Choy) and remaining of the stock and let everything simmer for 12-15 minutes; then add Bok Choy and cook for 3-5minutes more. When all the ingredients are cooked, sea salt and ground white pepper to taste. Turn off heat, and add 1 tsp of toasted sesame oil, gently mix for flavors to combine.